The 1.8m x 1.2m Homesaver Pod Fire Blanket. Fire blankets are historically associated with tackling chip pan fires, but the fire fighting versatility of the fire blanket is becoming increasingly recognised by fire safety professionals. From personnel to waste bin fires, offices to canteens, the applications for this simple to use and yet extremely effective fire fighting aid are numerous. Being easy to install and service, the modern fire blanket fulfils an essential role in any fire fighting strategy. Technically, a fire blanket extinguishes fire by forming an air tight seal, smothering the fire and cutting off the supply of oxygen. Manufactured from high performance textiles they are flexible, thermal coefficient, electrical and conductivity as well as vapour barriers for gases. 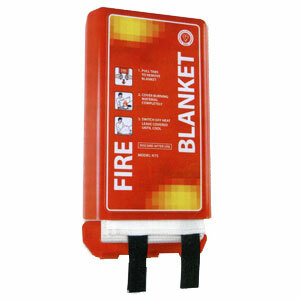 This fire blanket is ideal for commercial kitchens, workshops, the home and boats. Available in Red or White container. Replace when used to combat a fire.